Located on the island São Miguel, in the group of Portuguese islands of Azores, Ponta Delgada developed following the trail of the ancient port and the sea. A landscape that seems magical, thanks to the shape of the volcanic soil, a temperate climate that makes pleasant your stay, plunged into the sea that binds to the sky. The city of Ponda Delgada, located in one of the nine islands of the Azores, Sao Miguel, has the merit of having developed over time with wisdom, to be today, with its 65 thousand inhabitants, the more populous city, as well as the largest, of all the Azores. With regards to the history of Ponta Delgada, everything starts centuries ago, when the Portuguese from the regions of Extremadura, Alentejo and Algarve, who settled here (we are in the fifteenth century), started taking advantage of the coves in the area for fishing, and exploiting the valuable geographic location of the island, between Europe and the Americas. The city is developed around the port: here begin the settlements and it is still possible to see where the line of the sea meets the land, highlighting the mark s of civilization. Throughout the city you can breathe the 500 years of history, thanks to the presence of historic buildings. Do not miss the Praça Gonçalo Velho, from which unfold lush gardens and ancient buildings. The many hotels in Ponta Delgada, have cleverly combined the respect for the environment with the ultimate in comfort: from these places of refreshment and peace can start the visits to the now extinct volcanoes (some of which can be explored by canoe as covered with water), activities that are passionate divers, and above all the sightings of whales. Those who wants to relax instead, can spend the whole day on the beaches of Pópulo and Água d'Alto. Fun is guaranteed in the many clubs of Ponta Delgada, a city that in certain periods, celebrates traditional events, such as the Carnival or the famous Batalha das Limas, the water battle, in which the inhabitants of the city fight in the streets shooting with weapons filled with water. Hotel Marina Atlântico is located on the main street of Ponta Delgada on the island of Sao Miguel, Azores. This luxury hotel is surrounded by ocean and enjoys a unique and fascinating atmosphere. 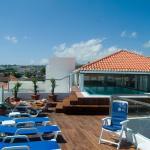 Hotel Ponta Delgada is located in the heart of Ponta Delgada on the island of Sao Miguel, Azores. Nearby are many tourist attractions of the island, including the splendid Church of the Holy Christ.